:::Whiffs, Glimmers & Left Oeuvres:::: Order As Catharsis? Can cleaning up help break up creative blocks? Who knows, I only spent the morning sorting and folding my hand-dyes and commercial batiks into one of those cute little vinyl suitcases with the clear side that I got from JoAnns - bless those coupons. Of course, I could only fit the warm colors so now I am committed to buy one or two more. While I was sorting, various pieces begged to be left out to play with one another including a shred of multi-colored batik printed with warped cheetah spots that I have hoarded for years. The spots were suggesting some sort of Alien Alphabet so I started doing page layout at about 10 this morning. Stopped to have my skin thoroughly creeped up by watching "The Grudge", did a quarter ton of laundry, washed my hair, made a loaf & 'taters dinner for my ever-appreciatve crew, and then went back to the machine to finish it off. 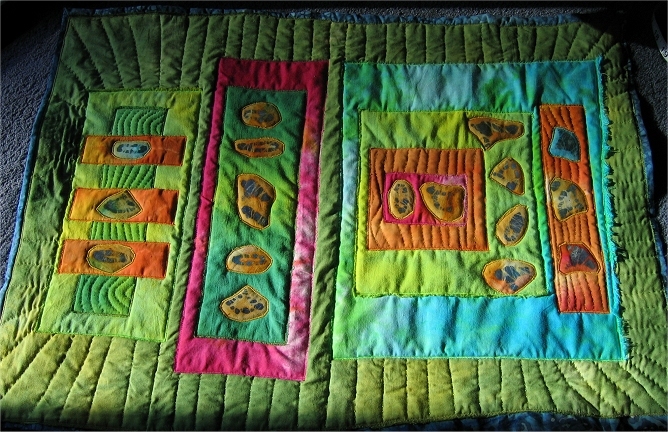 Here it is,20x27, "Alien Press - Front Page"(the quilting is not yet finished).